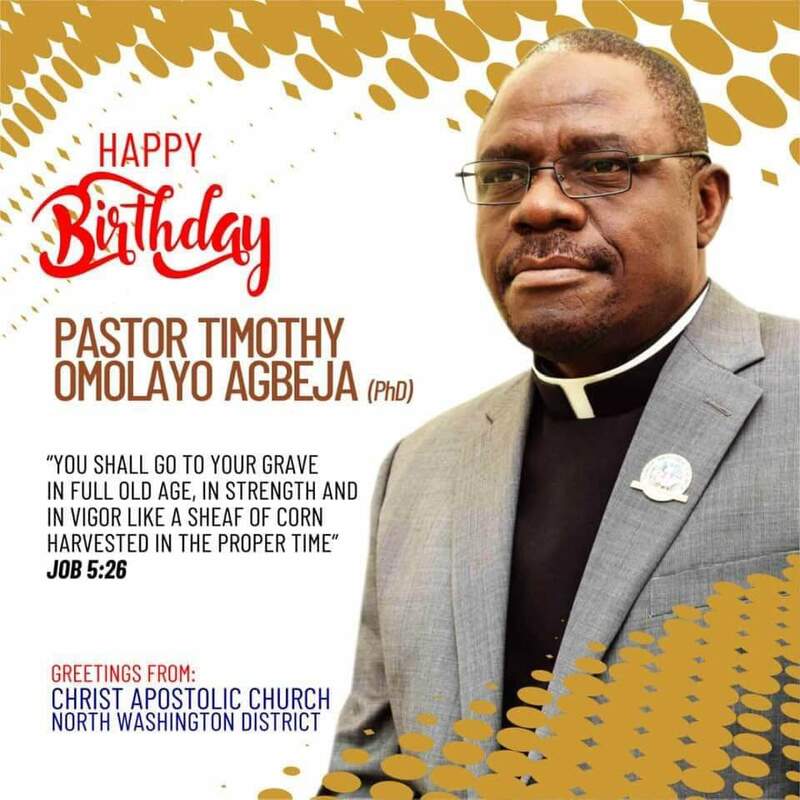 Today is an important and memorable day in the life of the Regional Superintendent of Christ Apostolic Church, Latunde Region (North America), Pastor Timothy A. Agbeja. This is because he was born on this day many years ago. Pastor Timothy Akinlolu Omolayo Oyewumi Agbeja was born in IIesha, Osun State Nigeria to the late Pastor Abraham Olayiwola Agbeja ( a District Superintendent in the Christ Apostolic Church) and Madam Lydia Folorunsho Pastor (Dr.) Timothy Akinlolu Omolayo Agbeja has been the beIoved pastor and teacher of the Christ Apostolic Church and mission for forty consecutive years. 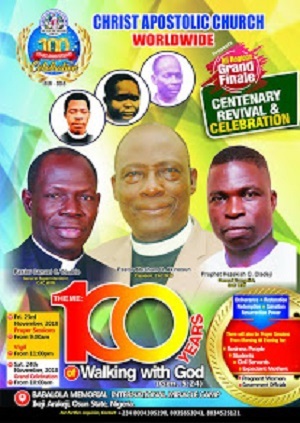 His dedicated service has been through the ranks of the clergy and in a wide range of socio-economic milieu from a little village in Idanre, Ondo State Nigeria where he started as a Catechist, to the United Kingdom as an associate/freelance pastor and to his present much coveted status of the Co-ordinator of C.A.C. North America and Canada. Pastor Agbeja, who had both his elementary and secondary education at his home town Ilesha, is a graduate of Christ Apostolic Church Theological Seminary in Nigeria from 1974 to 1976 and The Assemblies of God Bible College, Mattersey Hall England in 1983, with Diploma in Theology with Merit, he holds a Bachelor of Science degree from Somerset University, Somerset England (l984/85), Master of Theology (1987) and a PhD in Theology (1992) both from International Seminary, Plymouth Florida (USA). He also hold a Master of Art in Christian Care and Counseling from ShIelhoune University, Northern Ireland (2000) as an enhancement of his ever functional spiritual gift He is a chartered member of The American Association of Christian Counselors (AACC) and a Certified Temperament Counselor and a Professional Clinical member of: National Christian Counselors’ Association Since his call to the Ministry in 1974, Pastor Agbeja has distinguish himself as an ardent orator, a sagacious counselor, a tenacious builder, a faithful ministry father, an articulate teacher and an anointed preacher a man of overwhelming spiritual gifts. To God be the Glory! Above all these credentials, Pastor Agbeja is a born again Christian Minister who likes to minister rather than to be ministered unto. To him leadership is service! Dr. Agbeja’s spiritual gift instantaneously showcased him as a missionary whose visionary leadership has planted and pioneered many churches in many states since when he migrated to the USA, Most of these churches continue to bubble with the power and vigor of the Holy Spirit till to day. As a teacher of The Word he has the double honors of serving as the Principal of the WOSEM Bible College and Theological Seminary, Akure and at the same period as head of The Christian Education Department of the World Soul-Winning Evangelistic Ministry (WOSEM) also in Akure, Nigeria for two and a half years. He served as the Provost of the Washington metropolis campus of the International Seminary and an associate Professor at Bethel University of Biblical Studies, Sliver Spring, MD., all of these to the glory of God. 1. Evangelist In-Charge, Christ Apostolic Church, Okedo / Oke Ododo Street Idanre, Ondo State, Nigeria 1976-1978. 2. Evangelist In Charge, Christ Apostolic Church; Bariga/Oworonshoki, Lagos, Nigeria. 1978 – 1981. The Church moved from Bariga to Oworonshoki where he worked with the Church in constructing a brand new duplex mission house and a brand new Cathedral Church Building. 4. Principal / Head of Christian Education Dept; WOSEM-Theological College, Akure, Nigeria – 1985 to 1987. In charge of administration, developed new curriculum and instructional materials. 75 Students. 5. Help Inaugurated the Church in Providence Rhode Island in 1986 during his first visit to USA. 7. Senior Pastor, Christ Apostolic Church, New York— 1988 to l990 In charge of overall shepherding of the Church with growth from about 70 to over 165 members. 9. District Superintendent / Assistant General Superintendent Christ Apostolic Church, Washington /Southern California Districts – 1996 to 2003. 10. Chairman/Snr Pastor Christ Apostolic Church Washington / DCC. Christ Apostolic Church Hyattsville, the Headqt., from December 1995 to December 2011, in charge of overall shepherding of over 500 members. In charge of administration of Churches in four Districts. He led C.A.C House of Praise (HOP) in pastoral care and evangelism since the Lord sent him to Washington in 1995. Pastor Agbeja was typically the Moses that led the church family from its old 11th Street location into their new five hundred thousand dollar property at Edmonston Road in Hyattsville, Maryland, with less than 100 membership. Since then, Christ Apostolic Church (HOP) is known for its energized church growth ministries in praise and worship, witnessing and youth education. More than 100 people have been encouraged to enter the gospel ministry under his pastoral care, with some serving as pastors in several churches. The tremendous growth of the Church demand for a need to start the planning to developed their almost two acres of land, a two phase project was then determined. To the glory of God he led the Church into the building and completion of the present state of art edifice, built from the ground up at the rough estimated amount of over 2.3million dollars, which is the first phase of the project and was dedicated in July 2009 by the former President of the Mission, Pastor E. H. L. Olusheye; the arrangement is going on the commencement of the second phase by the grace of God. 11. Superintendent / Snr Pastor Christ Apostolic Church, House of The Word; the headquarters of C.A.C. 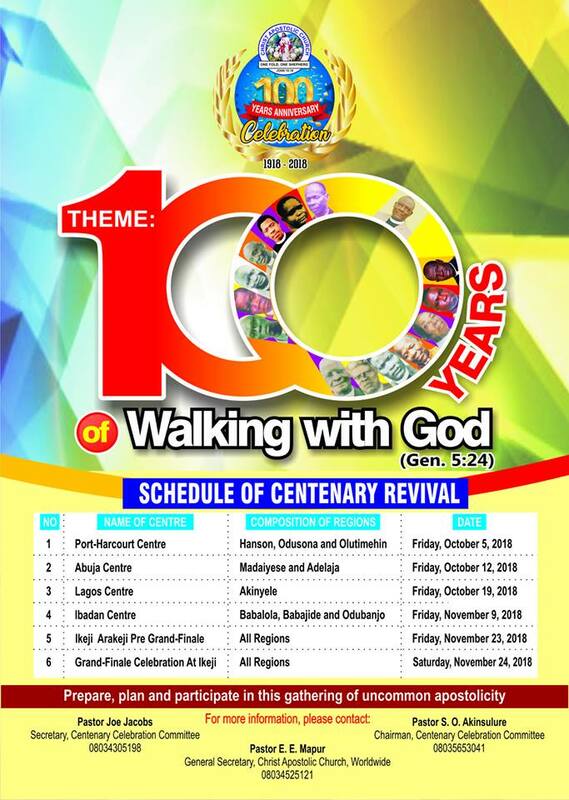 California DCC – December 30th, 2011 to September 30th, 2015. 12.Just being transferred back to Washington DCC after his promotion to the office of the Coordinator of C.A.C. North America, C.A.C. House of Praise is now the Administrative Office and Headquarters of C.A.C. North America, on October 1st, 2015. Dr Timothy Omolayo Agbeja is one of the foundation/pioneer member of the Pan-African Organization which was established in New York under the inspiration of a Nigerian – Chief Jumoke Ogunkeyede in 1989 that co-ordinate the affairs of African and African in Diaspora. And due to Dr. Agbeja’s beliefs for a strong unity among ministers of the gospel -especially within the Pentecostal and Evangelical circles; he worked strongly for the development of the ministers’ Council in New York City, under the tagged name United African Ministers’ Council where he served as the Vice Chairman from 1989 to 1990. He repeated the same effort while he was in Los Angeles, California as he helped in organizing “The African Ministers’ Council” together with some well meaning spiritual leaders, he also served there in the capacity of the Vice President until December 1995. He was also the Spiritual Adviser to a joint political Organization of all Nigerian sub-political groups in Southern California called “The Organization of Nigerian Unity (ONU); He also served as the Member of the Los Angeles County School District Advisory Committee from 1993 to 1995. Soon as he arrives in Washington D.C. metropolitan area, he joined-the already existing “The Nigerian ministers’ Council” and he at a point serve as the Vice President of the Organization. His Church worked in full support of “African For Jesus” Prayer movement and” IGO Ministries”, an organization which passionately work for the Spiritual, Socio-economical and educational advancement of the people in the Continent of Africa in providing for the need of the less privilege, supporting social structures, building orphanages and providing spiritual-stability in different Countries of African, he had made quite a number of journey with this organization on Mission purpose at his own expense to Nigeria, Democratic Republic of Congo, Ethiopia, and just recently to Dar Es Salaam in Tanzania, he also serve as the Vice Chairman of the of Director of this Organization –2000 to present. organization he established in memory of his late father, which presently sponsoring five students through their high school certificate and a choosing one student in one of our University in Nigeria. His leisure time is spent with his children watching movie, reading and browsing through his laptop. Mayor 2004. Another Proclamation in commemoration of his Birthday in 2012 by the City Mayor represented by Councilman Ficklin Walker. Also a Certificate of Congressional Commendation, in commemoration of his Forty Years in the Ministerial Service in October 18th, 2014. Pastor Timothy Agbeja is married to Evangelist Agnes Adebomi, nee Adeniji both working as a team of two-in-one minister. They are blessed with five children with a divine selection of all their initials—,Bukky, Bumni, Bola, Bisi and Bode. He considers his family his greatest earthly blessing.